Most of what we know of the Palaeo-Eskimos comes from archaeology. This room contains a reconstruction of the kind of archaeological site left by the very early Palaeo-Eskimo explorers. 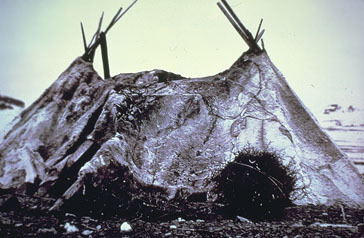 It shows the remains of a tent dwelling, which would have been covered with animal skins and supported by driftwood poles. The skirts of the tent were held down by an oval ring of boulders, at the centre of which was a square hearth box built of stone slabs set on edge in the gravel. Flanking the central hearth were two parallel rows of vertically set stone slabs, running from the front to the back of the dwelling and forming a "mid-passage" that divided the dwelling into three areas: a living area on either side and the mid-passage itself. 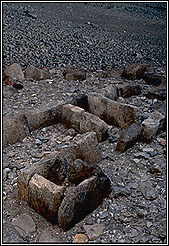 This very distinctive structural arrangement is also found in northern Eurasia, where it was a feature of the traditional dwellings used by Siberian groups and by the Saame people of northern Scandinavia. This type of dwelling was used throughout the many centuries of Palaeo-Eskimo occupation of Arctic North America and reflects their ancient Old World heritage. 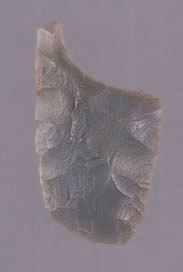 The artifacts found in sites such as this provide other hints of the Asiatic ancestry of the Paleo-Eskimos. Many of the tools are made in styles very similar to those used by Siberian peoples of the time, and some elements of Old World technology were probably important in enabling the Palaeo-Eskimos to adapt to Arctic conditions. 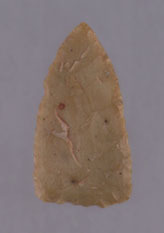 These include the bow-and-arrow, which the Palaeo-Eskimos seem to have brought to America for the first time, and finely tailored skin clothing. 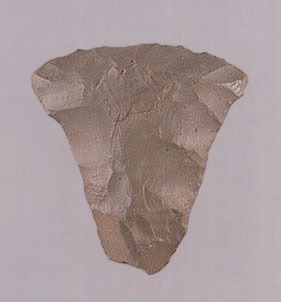 Tiny chipped-stone weapon points, recovered from the gravel floors of their tents, could only have been used effectively to tip arrows. 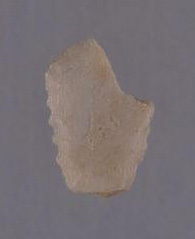 Fragments of broken bone needles are among the most common artifacts recovered from these sites, and they are our only witness to the labour and skill of the seamstresses whose work enabled humans to first occupy Arctic North America. A few small carvings are known from this very early period. 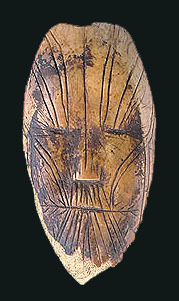 The earliest-known portrait of a Palaeo-Eskimo is a small ivory mask found on a site that dates to over 3,500 years ago. Only a few centimetres high, it portrays a serene human face with closed eyes. The forehead, cheeks and chin are crossed by a series of elegantly curved lines that probably represent tattooing, and the face emanates tranquility and grace. This face is the stylistic ancestor of the Tyara maskette shown at the beginning of the exhibit, which was carved over a thousand years later. 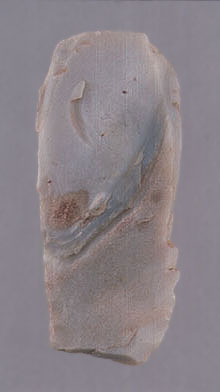 Another form of artistry is illustrated by the small chipped-stone point featured in this room. 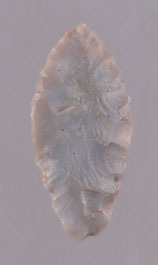 Chipped from hard glassy flint, and made to tip a hunting arrow, this tiny weapon is also a work of art. Its miniature size, the selection of colourful stone and the well-executed edge serration indicate the pride with which Palaeo-Eskimo craftsmen demonstrated their mastery of stone-chipping, one of the most difficult crafts in the world.